Thank you to all of you for your well-wishes and e-mails. It means a great deal to me to know there’s so much support coming from all over the web. I go between excited and nervous, often within the space of minutes, and oftentimes simultaneously, so it’s definitely never dull here. I also didn’t mention that while I haven’t been able to report any outlandish food cravings, my sweet tooth has really diminished! Which is weird and disconcerting, and of course not the best news for a dessert-themed blog. I still want to bake, but many times I just don’t know what I want to make. Maybe it’s nature’s way of telling me I’ve already accumulated enough sugar in my system over the years and I need to put some other foods in it? Anyway, that means that I’m turning more to my neverending pile of cookbooks for inspiration when my brain is completely sugarfree. I can’t think of anything better to welcome the autumnal equinox (September 22!) than some warm, fragrant, fresh-from-the-oven bread. Especially when it’s a plush, buttery brioche stuffed with apples and spice. 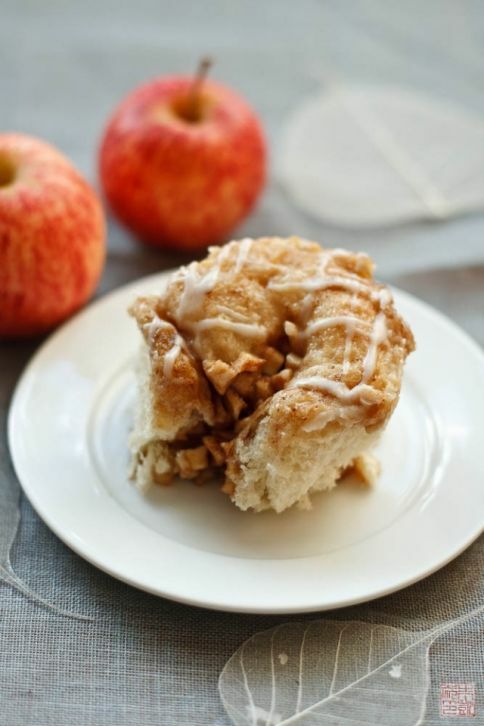 These apple cinnamon pull-aparts are from More from Macrina , the latest cookbook from Macrina Bakery. I had the opportunity to visit this sweet little shop while I was in Seattle for BlogHer Food, and I only regret that I wasn’t in town long enough to go back multiple times. 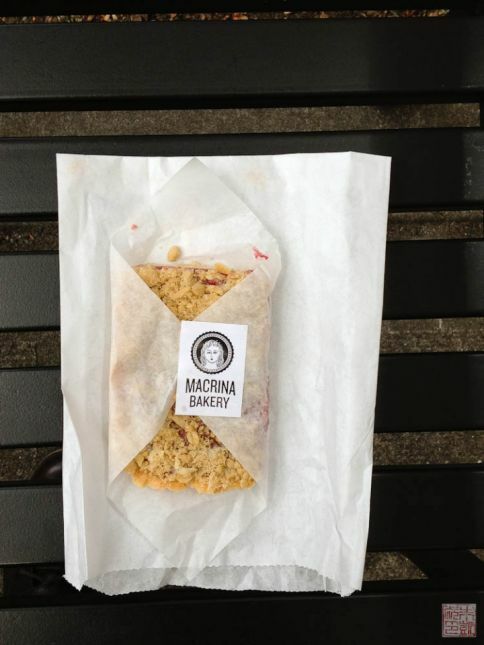 A yummy jam-and-streusel bar I got at Macrina. More from Macrina is the second book to come from Macrina: the first one, Macrina Bakery and Café Cookbook , came out ten years ago. It seemed high time for a sequel, and I think it’s a great one. The book covers not just simple cookies and cakes, but many of the artisanal breads that Macrina is famous for, like their baguettes, pugliese, and flatbread. I also like that there are chapters dedicated to some cafe dishes Macrina serves, such as their BLT or their savory bread pudding. What can I say? This baby growing in me doesn’t have a sweet tooth but a savory tooth! I like that many of the chapters feature a master recipe (like brioche) and then have several recipes showing how to use the dough – I love baking books that show how different pastries are related. The design is quite elegant and clean – Sasquatch did a beautiful job with this book. So back to this apple cinnamon brioche. These pull-aparts are essentially pumped-up cinnamon rolls: the dough is Macrina’s rich brioche rolled around some baked apples, sprinkled with cinnamon sugar, and topped with a buttermilk glaze. The cookbook has an entire chapter dedicated to brioche, prefaced with an eloquent paean to that sweet dough. Every time I make brioche, I always wonder why I don’t make it more often, and then I think it’s probably a good thing I don’t make it more often with just two people (and a hungry doggie!) in the house. All sorts of wonderful heirloom apples are showing up at the farmers’ market right now. The ones in the photos are some fantastic Royal Galas from Devoto Gardens; I used some of them plus some deliciously crisp Mutsus for the rolls. Macrina’s brioche is pleasantly pillowy and not-too-sweet, and a great base for the apple filling. Although the recipe calls for baking the apples in the oven and chopping them up, I found that cooking them on the stove worked equally well. I guess it’s a toss up whether you want a dirty skillet or baking sheet, but I preferred chopping up the apples beforehand into cubes instead of trying to chop them after they’d been cooked. Either way, mixed with cinnamon, brown sugar, and nutmeg, they make a wholly satisfying filling. The rolls baked up delightfully huge and puffy, and we had to restrain ourselves from eating the entire pan in one go. So get yourself some apples and celebrate the advent of autumn. I can’t believe there’s only three more months left till the end of the year! I received a review copy of More from Macrina from the publisher. Oil inside of a medium bowl with canola or vegetable oil. Set aside. Add milk, vanilla, eggs, flour, and salt. Combine mixture with dough hook on low speed for about 3 minutes until dough has come together. Increase speed to medium and continue mixing. Add butter, a couple pieces at a time, letting them combine into the dough. Add the remaining sugar and mix for another 4 minutes. Check the dough: if you can stretch it out for about 3 inches without it breaking, it's ready. If it tears, mix a couple more minutes. Transfer dough to lightly floured board and form into a ball. Place into prepared bowl, cover with plastic wrap, and let proof for about 2 1/2 to 3 hours until it has doubled in size. You can now use the dough, or refrigerate overnight and bring back to room temperature to use. Peel, core, and cut apples in 1/2 inch cubes. Melt butter in a sauté pan over medium heat. Add the apples and sauté for about 8 minutes until the apples are semi-soft. Add sugar, flour, cinnamon, and nutmeg to the apples and stir to combine. Cook until mixture begins to bubble, then turn heat to low and cook for another 3 minutes, stirring constantly. Transfer filling to a bowl and let cool. Combine sugars, cinnamon, and vanilla in a medium bowl and set aside. Line bottoms of two 9-in cake pans with 10-in rounds of parchment paper, creasing paper so it fits up the sides. Cut four 2"x15" long strips of parchment and place along the sides of the pans (2 per pan), to protect the side of the pans. Place brioche dough on a lightly floured work surface. Roll out dough into a 7"x16" rectangle, with the long side towards you. Spread apple filling evenly over the dough. Sprinkle the cinnamon sugar mixture over the apples, reserving about 1/4 cup for garnish. Roll up the dough from the far side. It will stretch as you roll, so the final length of the roll should be be about 24". When log is finished, let it rest seam side down for a few minutes. Use a sharp knife to cut roll into two 12-in logs. Cut each log into seven 1 1/2-in pieces. Arrange 6 pieces in a circle in each prepared cake pan, and place the seventh piece in the center. Mix egg with a little water to make an egg wash and brush lightly over the tops of the rolls. Sprinkle the reserved cinnamon sugar over the rolls. Let pans of dough rise for about 1 1/2 hours until the rolls have risen to the top of the pans. Preheat oven to 325 degrees F. Bake rolls for 25-30 minutes until they are golden brown. Let cool for about 10 minutes, then unmold from pan and remove parchment pieces so they don't get stuck. Sift confectioners' sugar into a bowl. Add vanilla and buttermilk and whisk until smooth. Drizzle glaze over the tops of the rolls. Serve warm. I just remembered a gift a friend of mine received at her baby shower from her mom. It was a photo frame with the most important message a new mother could have. It went something like this, don’t worry about not knowing how to be a mother, your baby never had one before. In short, lots of common sense, TLC, do what feels right for you and your baby, and smile and nod at the dozen people giving your advice you never asked for, then forget what they said. Your baby will bond to you, he needs you, you will provide food, security, and warmth, and you will love every second. Get a good baby first year book for reference, decide what your style of mothering will be (breastfeeding or not, co-sleeping or not, baby wearing or not, be prepared to change your mind when baby comes though) and if you have a trusted friend who seems really good at being a mother ask, her for advices. It is going to be OK! Congrats, this is such an exciting time for you & your family! Thanks for the delicious looking recipe, I’m going to try it soon. I craved hot & spicy foods when I was expecting (all 3 times). My kids, to this day love spicy food-the hotter the better! That simply looks wonderful. I too love baking brioche, and I love that this is so unique. I believe this will be in my oven before long. Wow these look so yummy! 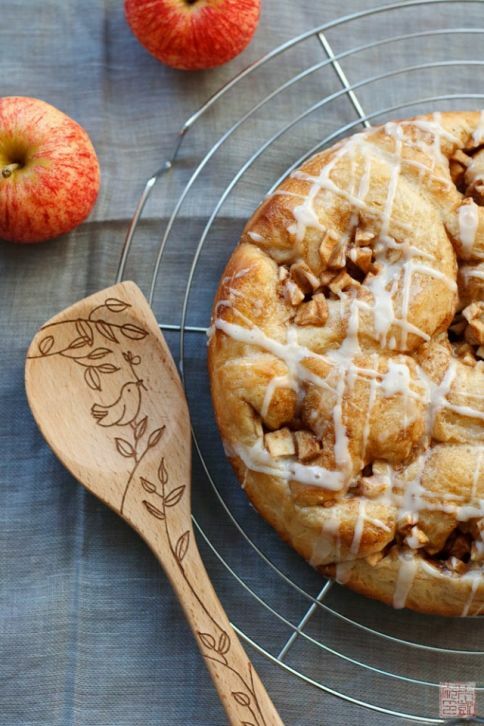 I love anything with apples and cinnamon =) Beautiful work! As a former bakery owner, I’ll bet she roasted her apples rather than sautéed because cook a lot more on a baking sheet than in a skillet. I agree with you that for the home cook, a skillet is more comfortable. I just finished, “European Tarts, Divinely Doable Desserts with Little or No Baking” due out at the end of October. All of the recipes are from the bakery of 23 years and I know there were ways of doing things in the bakery that aren’t necessarily done that way at home. This appearance of apple creamy looks very delicious!! !just gone through the recipe,simple directions to follow ..looks so good to serve. Love Macrina Bakery! Thanks for sharing the recipe! I would love to try this sometime. Website is looking great.